Here we are witnessing one of the most surrealist composition of a shot in Fassbinder’s “Chinese Roulette”. Fassbinder is not showing in his films (obviously) “bad” or (unambiguously) “good” people, as it’s natural in movies of totalitarian countries where criteria for defining human “badness” or “goodness” of a movie character or a person in real life are simplistic because the ideology of the ruling elites eliminates from the picture the reasons and the nature of criminal, deviant, sociopathic or just bad behavior or, conversely the civil, humane, polite, peaceful and rational ones. Fassbinder as a person with democratic sensibility shows the problems of human life without any authoritarian/totalitarian judge-mentalism, because for him the task of democratic art is exactly to depict and express the psychological and social etiology of human behavior, its roots and its environment. “Chinese Roulette” in a blasphemously abridged form is a film about an early-adolescent girl with an angelic appearance but with an extraordinary mind, and (even more about) her parents, a wealthy and glamorous couple, who feel guilty that their child is physically crippled. While watching the film we start to understand that the problem making Angela’s parents to suffer is not just having a crippled child, but that having such a child means for them a personal fiasco and, therefore, is a sign, that they’re not perfect, that they have a basic flaw in their very ontological nucleus. More, step by step we understand that Angela’s mother – Ariane (Margit Carstensen) and her father – Gerhard (Alexander Allerson) got, just because their daughter is physically crippled, an ontological inferiority complex of a devastating power. A crippled daughter looking like an angel (as Angela, indeed, is) was for them an additional – final blow, as if, Creator’s laughter at them. Ariane and Gerhard feel as a rotten tree, as if damned in their very nature from the beginning. Angela had to try to help herself – to invent her own psychotherapy and she even tried to psychotherapeutically help her parents to understand the irrationality of their behavior. This is the meaning of the film’s sujet. The equivalent in US of the 21st century of Angela’s parents’ psychological predicament can be the situation when a person feels that he is not successful enough to respect himself and be really respected by others – that in spite of the fact that he whole life was crazily trying but is not a billionaire or at least a full-fledged or “full glass” millionaire, that Mr. Smith or Mr. Smooth or Mr. Speck are ahead of him, that his career is in shambles instead of souring high up like a missile or drone, etc. In short, it’s here, in this semantic spot of human aspirations and despair Fassbinder created a shot like the one we offer here to the viewers’ attention. The director not really laughs at people like Angela’s parents – with megalomaniacal psyches, but he is expressing his tormented amazement about the existence of people like them, about their precious personalities. For Fassbinder it is an enigma of human pathology that it is possible instead of helping their daughter to live and find herself, – to keep themselves in front of themselves as a priceless broken vase, self-admiringly and insufferably self-sufferingly. We see in the still how Ariane and Gerhard suffer – not because their daughter is cripple, but because their “genetic superiority” is shattered (American version of the same psychological context will be – “financial superiority”). 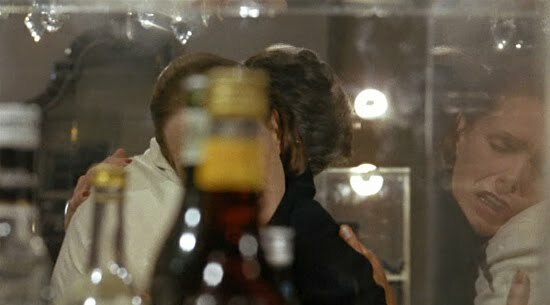 We see that the director has a bottle of liquor closing – as if smashing Ariane and Gerhard’s faces while they are looking at each other crying together in public – when they confess to one another about their love. The misguided achievement of their moral selves is that they learned to love each other in their very failure, not in their triumph. But they never will learn to love neither for achievement (typical solution), nor for failure to achieve (obsessive solution), but to love for life itself, for unique possibilities of human relationships, for otherness of another people. Yes, Ariane and Gerhard never will overcome their trauma, never will go out of it – to forgive themselves and their god. Even failure for people with megalomaniacal complexes is too big and too important – they cannot stop emotionally gluing to it. They will continue to try to aggrandize even what for them is their very fiasco. They will not be able to help Angela and themselves to focus on life together. We see on the right of the shot – Ariane’s face distorted by her megalomaniacal suffering (as big as the cosmos). She made Angela’s crippleness the failure of the universe. Ariane’s super-human suffering is reflected by the configuration of glasses and crystals in a luxurious family house.